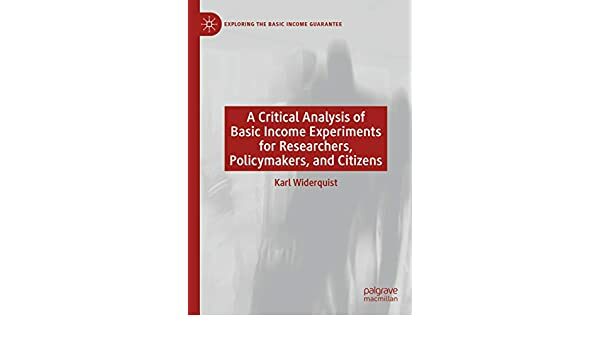 Karl Widerquist A Critical Analysis of Basic Income Experiments for Researchers, Policymakers, and Citizens, Palgrave Macmillan, December 2018. In case you can’t find my book at your university library, I posted an early draft of it (and as far as I know everything I write) for free on my personal website. Karl Widerquist “A Failure to Communicate: What (If Anything) Can we Learn from the Negative Income Tax Experiments?” The Journal of Socio-Economics (2005). You can find an early free version here. Calnitsky, D. (2018) ‘The employer response to the guaranteed annual income’, Socio-Economic Review, 25, 75–25. Kangas, O., Simanainen, M. and Honkanen, P. (2017) ‘Basic income in the Finnish context’, Intereconomics, 52, 2, 87–91. Karl Widerquist, “The Cost of Basic Income: Back-of-the-Envelope Calculations,” Basic Income Studies, 2017. Again if you don’t have access through your university, you can find an early version of The Cost of Basic Income on my personal website. “Basic Income: An Anthology of Contemporary Research” is helpful, although only a small part of it is empirical. Widerquist, K., Howard, M. (Editors) Alaska’s Permanent Fund Dividend: Examining Its Suitability as a Model and Exporting the Alaska Model: Adapting the Permanent Fund Dividend for Reform around the World, two books both published by Palgrave Macmillan in 2012. Contact the editors (karl@widerquist.com) if you have trouble locating the books. Go to Google Scholar: search “basic income” and/or other names for the concept with our without additional key words to narrow it down. Scroll through as many pages of links as you have time for. Go through the tables of contents for each issue of the journal Basic Income Studies. Go through the news on Basic Income News, as far back as you have time for, looking for mentions of and links to new research. Go to the “Basic Income FAQ/wiki,” on Reddit and look for the empirical articles. I’m leaving out a lot of good stuff because I can’t find it online, but those things together should give you a good idea of the current state of UBI research. What links would you add (please answer only if you can give the full information about it including an actual links to it)? Please consider the Global Resource Bank’s universal basic income at grb.net.